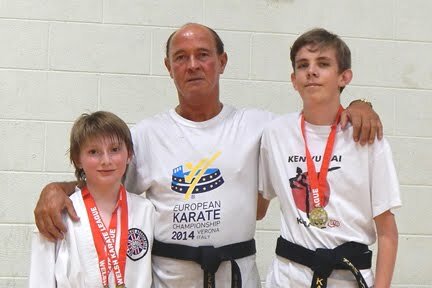 Three students where selected to represent Ken Yu Kai Karate from Eccles in the 7th WUKF World Championships in Scotland and all three medalled including a world title, this was an amazing achievement as the competition involved over 2000 of the best karate athletes from 41 countries in the largest karate event on the sports calendar. The WUKF World Championships was held in Dundee from the 14th June and involved 4 days of intense competition of all different age groups & styles. 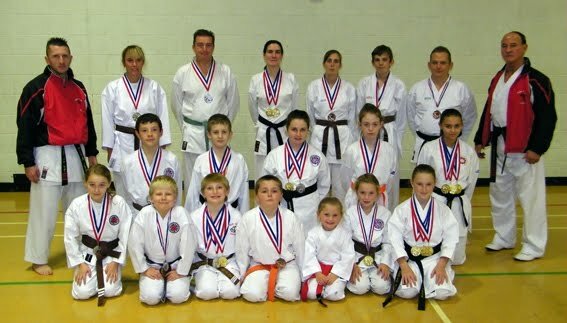 The first medal won for Eccles was by Samantha Kinsey in the Kata all styles female children brown to black belt 9 years category where she became the silver medallist and was only narrowly beaten into second place. Not to be outdone by his little sister Daniel Kinsey won the second medal for Eccles and in doing so achieved his dream and became the world champion by winning gold in the Kumite male min cadets open grade 13 to 14 years category his dedication to his Karate and the support of his family and coaches has now paid off with the highest accolade that can be won in the world of Karate. The final medal was won the last day by Karl Boyd in the over 15 Male adapted Kata category achieving a silver medal in this disabled section is a great result for Karl who was born with Cerebral Palsy and has proved time after time that with the right positive attitude you can overcome anything. Daniel Kinsey (2nd Dan) added to his international tally of medals last week in the UWK World Championships in Montecatini Terme, Italy, He represented England in the Individual Kumite 13 -14 Sanbon and came away with a well disserved bronze which is the first trophy he has won for England, Daniel has competed for several years on the international circuit with great success including becoming the European champion but this was the first competition for his country and to come home with a medal is a great achievement and will no doubt be up there with the other great victories for this talented young athlete. 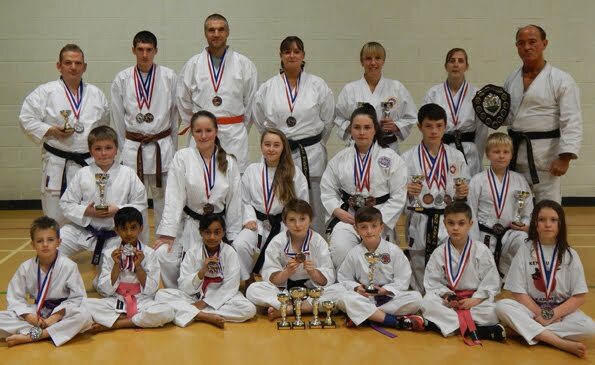 This years’ KYK Nationals competition saw us take the smallest squad ever to the competition with only 13 of our students competing yet Eccles Ken Yu Kai Karate still manage to bring home a great haul of 14 trophies 8 of which were gold. The first gold of the day went to Rebecca Roberts in kumite from our Abram club improving on her silver trophy in the same event last year. Both Daniel and Samantha Kinsey had a stunning day with the both of them retaining their double titles from last year in Kumite and Kata Daniel also managed a third gold with his team mates Hiren Pandya and Annalia Garratt in the team kumite in which they won all of their fights and was the exciting finale to days events. Great work guys. This years’ KYK Nationals competition was the toughest in the last few years bringing together clubs from as far away as Jersey. It was also the first time that G.K.K.C., a new club to the Ken Yu Kai Karate Association attended the competition and they have several W.K.C world title holders within their ranks. Retaining the shield for Eccles Ken Yu Kai Karate was no easy feat with such talent attending this years’ competition. The final result came down to just one medal with the overall result of 46 trophies being enough for Eccles to hold onto the coveted Terry Pottage Shield for an amazing third time. Ricky Birchall 7th Dan, Sensei at Eccles said, "To come away with the top club award and retain the Terry Pottage Shield for the 3rd year running was an amazing achievement for my club and I would just like to congratulate all of my students who took part and kept the flag flying high for Eccles Ken Yu Kai Karate". Daniel Kinsey goes from strength to strength in the build up to his world title shot in Poland this October by adding another gold and silver to his brilliant list of trophy's this year, they were both won at the AMA Northwest Karate Championships on the 7th September at Bury Castle Leisure Centre, Bury. His gold was won in the 10 to 12 year old Kumite section in which he has shown a massive improvement as the list of titles he has won in the last twelve months has shown, his silver medal was won in the 14 and under kata section beating other competitors several years his senior giving him the best preparation he could of hoped for in the run up to his next championships the world title in Poland. The whole club and the Ken Yu Kai Karate Association would like to take this opportunity to wish Daniel the best of luck at the world championships and we all know he will do himself proud. Good Luck Danny Boy. 13 July saw three of our clubs students attend the Welsh Karate League's 4th round which was held at the University Sports Centre Plas Coch Wrexham of which two of them came away with gold. The first gold went to Karl Boyd in the Special Needs Kata category this was the second time that Karl has been able to enter this category the first of which was in the 2013 Ken Yu Kai British Open where he also came away with gold. The second Gold came for Daniel Kinsey who in June Became the boys under 10 Wukf European Champion his gold was in the under 12 Advanced Kata category in which the final saw him come head to head with his female counterpart Chiara Baker who is the girls Wukf European Champion, this was a stunning final and was to close to call but with two flags to one seeing Daniel became gold medallist was a great sight beating a worthy competitor, this came on the back of him winning Bronze in the under 12 Advanced Kumite category just a little while earlier. Well done boys. Two of the clubs best fighters have added to their collection of medal at the AMA national championships which where held on 5 & 6 July at Leigh Lesiure Centre, Daniel Kinsey won his silver medal in the 150cm and under section which was open to all belts and styles while Ben Parkin won his bronze medal in the 160cm and above section which was also open to all belts and styles. The AMA National Championship had simultaneous competitions for Karate, Judo and Kick Boxing making it one of the most diverse competitions on the martial arts calendar. These great results come on the back of them both competing at the Wukf European Championships in Italy last month in which Daniel became the clubs first European champion making this a special year for both of these competitors and for the club, we wish them both all the best of luck in the remaining competitions of the year and great success at the Ken Yu Kai Nationals in November we are all expecting lots more trophy's from the both of them good luck boys. Daniel Kinsey a 10 year from Boothstown has taken the next step to becoming a World Champion in Karate by winning Gold at the Wukf European Championships in Verona Italy which was held between June 12 and the15th making him the first European champion in the history of the Eccles Ken Yu Kai Karate Club. All of his family were there in Italy with him to see him compete in the championships which had over 1000 other competitors taking part from 26 participating European country's in one of the worlds biggest Karate championships and to see him become the European Champion most of been one of the proudest moments of there lives. 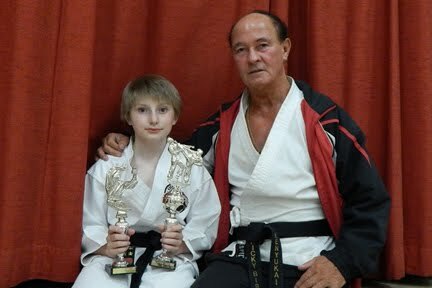 WUKF European Campion and in-between all of this he has achieved his 1st Dan Black Belt. His sights are now set on the world title at the WUKF World Championships in October being held in Poland " winning the world title would be the icing on the cake for this young star and I would like to congratulate him once again from myself and from all of his fellow students at the Eccles Karate club he is an inspiration to us all and we wish him the greatest success at the world championships in October" Ricky Birchall . 8 students from Eccles Ken Yu Kai Karate took there Black Belt grading on Sunday 24th May at the Failsworth Sports Centre and all of whom were awarded their Black Belt. This is the first time in the clubs history that so many were attempting there Black Belt grading at the same time which is the goal of anyone in martial Arts regardless of which style or discipline, it takes a minimum of 5 years of hard training and dedication to achieve this of which many of the students who begin Karate never see to the end this is a testament to these 8 students dedication to there chosen sport. Ricky Birchall 7th Dan instructor of the Eccles Ken Yu Kai Karate Club said "Everyone was over the moon at being awarded their Black Belt and I am so proud to have been part of that, there is no greater feeling than to see your students achieve one of the greatest awards that they will earn in there lifetime". The biggest applause of the day was for Karl Boyd an 18 year old student who began his life in Karate age 10 and despite being born with Cerebral Palsy managed to gain his Black Belt, having to grade to the same stringent grading syllabus as the rest of the students Karl's years of hard training having to overcome limited movement on his left side and moderate learning difficulties finally paid off making him one of the few reaching this goal in Karate. The grading was conducted by Terry Pottage the 8th Dan head of Ken Yu Kai Karate Association acclaimed and well regarded world wide for his Martial Arts and to grade in front of such a highly recognised instructor was a daunting prospect for them all. Both the Eccles and Langworthy Ken Yu Kai Karate clubs joined force with a devastating effect as part of the Ken Yu Kai squad which attend the 5th KYK British Open Championships where all but one of the Salford entrants won at least one medal ensuring an emphatic win for team Ken Yu Kai. The championships was held at the Castle Leisure Centre Bury on Sunday 29th September. The two Salford clubs alone manage an amazing win of 13 gold, 11 silver and 8 Bronze which helped secure an overall victory for the Ken Yu Kai squad at the Championships were they finished top of the medal table. This is a great result not only for Ken Yu Kai Karate but also for Salford who's two clubs have entrants participating in the WUKF European Karate Championships at the English Institute of Sport Sheffield on 17th - 20th October were we have a great chance of them returning as European Champions. flying for Salford Ken Yu Kai Karate at the European Karate Championships Good Luck. Eccles Ken Yu Kai Karate’s result of 63 trophies at 2013 KYK Nationals Competition on the 3rd of November was the greatest result the club has ever had at any competition its history. The Haul of 14 Gold 15 Silver 34 Bronze ensured that Eccles finished top of the medal table at the competition which was held at The George H Carnell Leisure Centre Davyhulme Manchester and helped the club to retain The Terry Pottage Shield which is awarded to the club with the best result at the competition, the club had won the shield for the first time the previous year and it’s great to see it retained for another year showing the dedication the club members have for the sport and their club. Congratulations to all of our students who entered the competition and keep the flag flying for Eccles Ken Yu Kai Karate.